Valiant shares plans for the extra-sized issue that marks Robert Venditti’s last on the title. 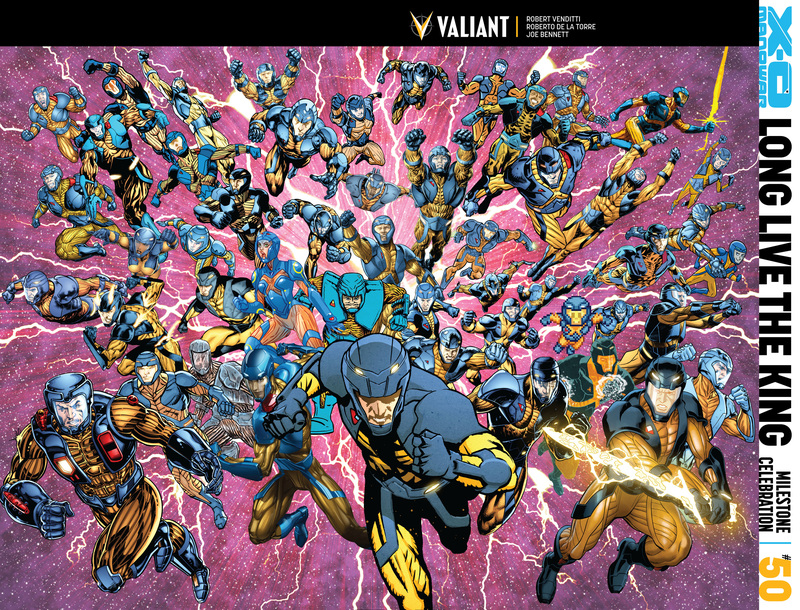 “X-O MANOWAR #50 will be, without a doubt, the single biggest milestone ever produced by Valiant,” said Valiant CEO & Chief Creative Officer Dinesh Shamdasani said in the release. “Beginning with the incredible jam cover, this issue will stand on its own as both a tribute to the character’s vital place in the Valiant Universe and the entirety of the years-long epic that Robert Venditti – along with artists Cary Nord, Lee Garbett, Trevor Hairsine, Doug Braithwaite, Diego Bernard, Rafa Sandoval, Robert Gill, and Valiant’s amazing editorial team– forged into one of the greatest narrative feats of the modern era. Big moments don’t get much bigger than this.” The issue also marks Venditti’s last on the title. Look for it in September.